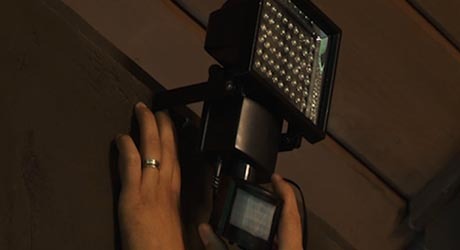 Motion sensor lights light the way when you return home in the dark and also discourage potential intruders. If you have an existing flood light, they are especially easy to install. 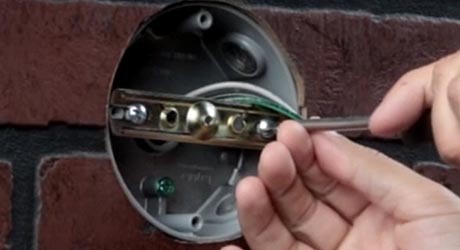 This guide will teach you how to wire and install a motion sensor light. The first step to installing your outdoor security lights or security spotlights is to shut off the power at the service panel and remove the existing floodlight. After that, run the motion sensor wires through the rubber gasket and splice them with wire nuts. While mounting the light to the box, position the gasket so it will keep the box dry. 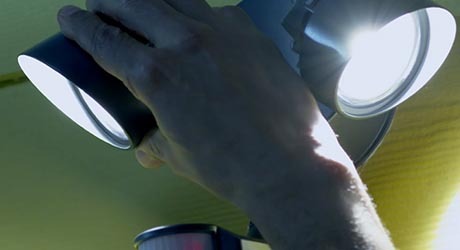 Restore power, loosen the locknuts and twist the light until it is directed where you want it. Then tighten the locknuts to hold the lights in place. Activate the motion sensor using the manufacturer’s instructions and choose how long you want the light to stay on when triggered. Test the sensitivity of the sensor by walking around it and adjust if necessary. Once your motion sensor light is installed and activated, leave the light switch in the on position and the lights will come on automatically when the sensor detects movement. With many models, you can change to always-on mode by flipping the wall switch off and on again quickly, and you can go back to motion detection mode by flipping the wall switch to off for approximately 10 seconds.